I’ve just returned from a magical land, one only existing in fairy tales. This land, Cumberland Island National Seashore, is a Georgia coastal island. It houses castles, land for wild horses to run free and beautifully bizarre trees with twisting branches unlike I’ve ever seen. Visiting Cumberland Island National Seashore is something I’ve wanted to do for quite some time and finally had the opportunity yesterday after spending Thanksgiving with my cousin Tim in Jacksonville, Fla. I woke up at o’dark-thirty for the less than an hour’s drive up to St. Marys, Ga., and took the 9 a.m. passenger ferry to the sea island. 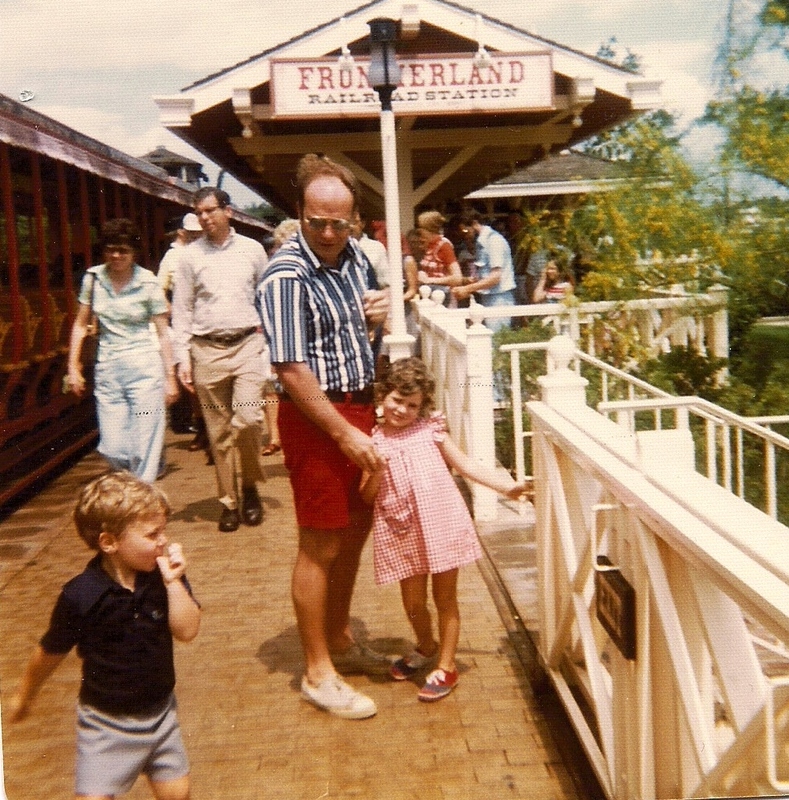 Other than private boat – and maybe a private jet – the passenger ferry is the ideal way to access the island. I have heard some people have kayaked, too. More power to ya! The boat arrived around 9:50 a.m. to the Dungeness Dock, the first of two stops on the island. the Sea Camp Dock is the other other. Around 10 a.m. a historical walking tour led by National Park Service Ranger Abron Crawford began and I have to say, the tour was excellent. 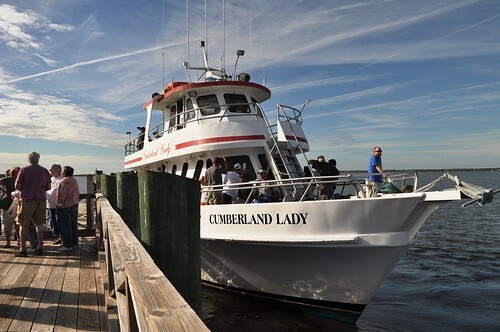 Cumberland Island is just over 17 miles long and motorized vehicles are limited to the few residents and park personnel so the way to get around is either by foot or bicycle. Bicycle rentals are limited ($16 for the day, $20 overnight) and bicycles are only permitted on the Main Road, North Cut Road and road to Plum Orchard so I opted to walk. The bikes are rented at the second ferry stop at the Sea Camp Dock. Not sure how much I walked but I ambled with the ranger to Dungeness Ruins, former home of the Carnegie family that burned down in 1959 (could be considered an American castle), over to the beach, up the beach to Sea Camp Beach, down the road to Dungeness again, then to the Sea Camp Dock to catch the 4:45 p.m. boat. Perhaps I walked 7 miles. It was such an amazing day with the perfect weather – it wasn’t too hot, there was a glorious breeze and the clouds moved in a little bit so it wasn’t too sunny. Absolutely perfect. Dungeness is the remains of the estate of Thomas and Lucy Carnegie, built in the mid-1880s. Thomas was the younger brother of Andrew Carnegie. 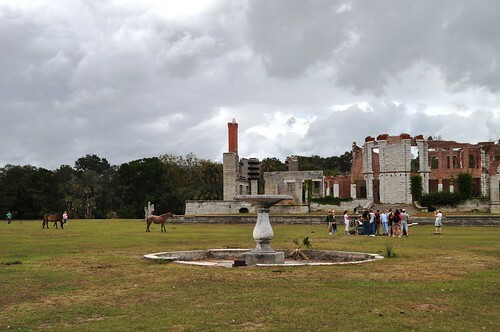 The estate saw little to no use after the 1920s and was not occupied when it burned in 1959. What’s left is the shell of the grand house. Nearby is a pergola, the oldest home on the island which was built after the Revolutionary War, shell of a greenhouse and deteriorated recreational hall. A little shack rested on the water behind the estate but had a private property sign so I couldn’t check it out. The ranger said when National Park Service plan for Cumberland Island is complete, 90% will be part of the National Seashore and protected. There are about 130 horses on the island and they tend to stay in small groups called harems. Since they are wild, the National Park Service does not maintain the horses meaning they don’t receive vaccinations, hooves aren’t shoed and they aren’t fed. 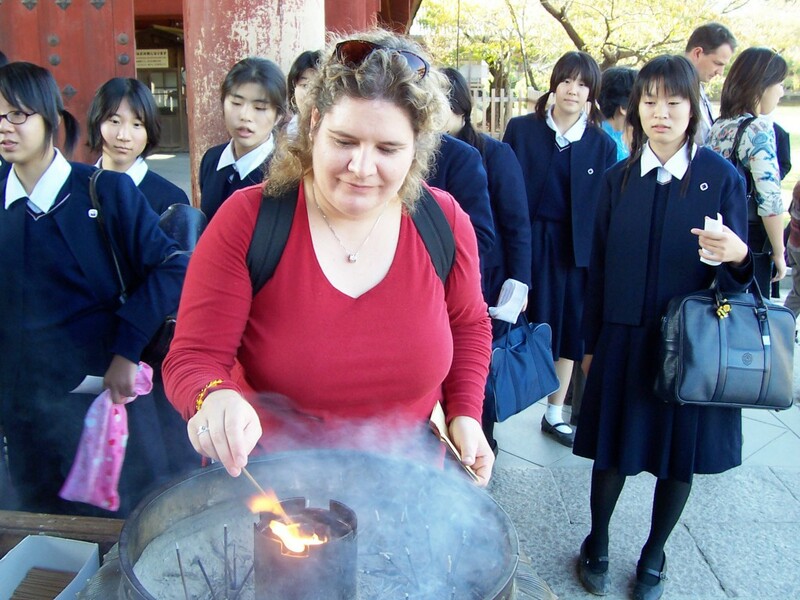 Visitors need to be reminded they are wild animals. I saw the horses right off the ferry at the Dungeness Dock but saw most by Dungeness Ruins, which is the most common place to see them. 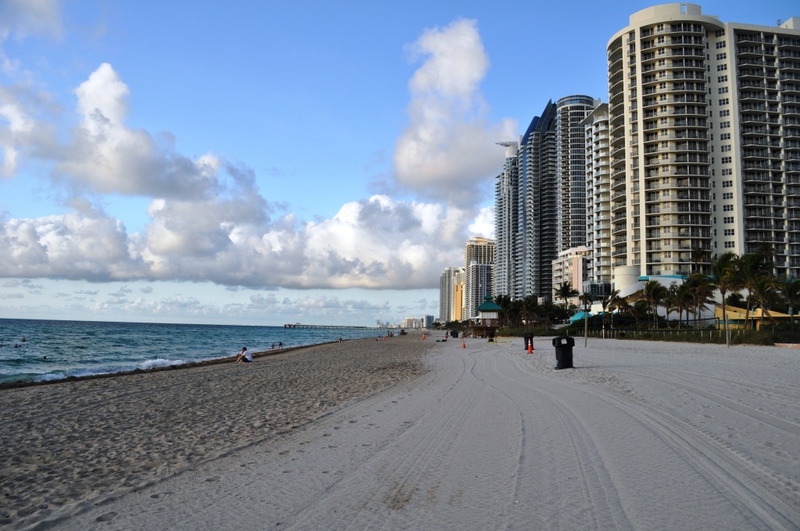 I’m guessing during the winter when it’s hot is when visitors can see them on the beach enjoying the cool coastal breezes. It was lovely being on the beach with only a few other people. I walked through the sand dunes, on a marked trail (walking over the dunes is prohibited), with a detour on a boardwalk over a salt marsh. Looking into the marsh grass I spotted hundreds of snails resting on each of the blades of grass. Over on the beach, shorebirds scurried about and chattered at me as I walked closer. The beach was sprinkled with a few shells but not very many. I saw tire tracks in the sand, obviously from a car of some sort, and was later passed by an SUV. I later learned residents of the island who gave their land to the federal government to create the National Seashore, have certain privileges, driving vehicles on the beach being one. Reaching Sea Camp Beach can be described as magical. The live oak tree branches reached out every which way. Tree branches from other trees reached out to form tunnels walk beneath. Pockets of camp sites are sprinkled throughout offering ample privacy. 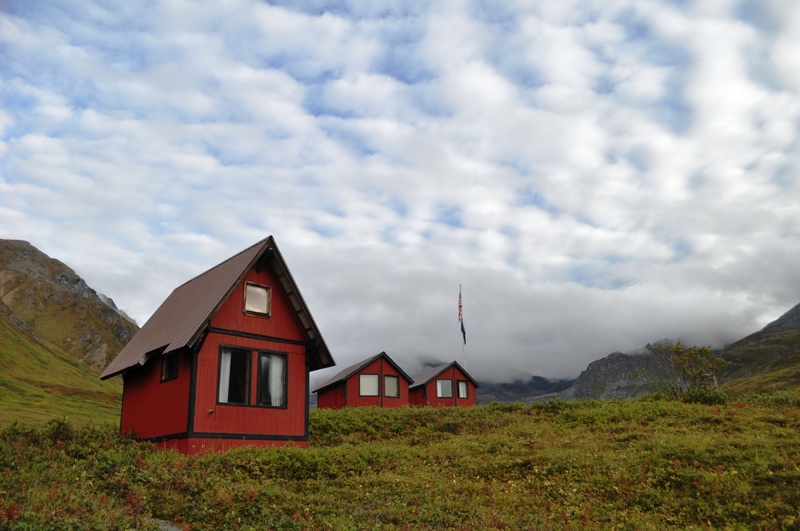 Restrooms, showers and water make a camping visit more comfortable. 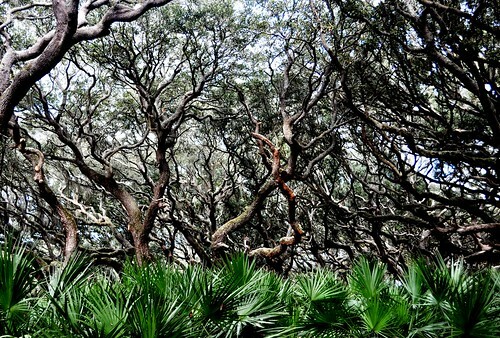 Other than gnats, camping at Cumberland Island National Seashore would be a treat. My senses took in the musty odors of wild horses, the sea air and pluff mud. I heard horses whinny and gallop and as vultures coasted overhead, heard wind slice between their feathers, similar to the sound a kite makes as it cuts through the air. 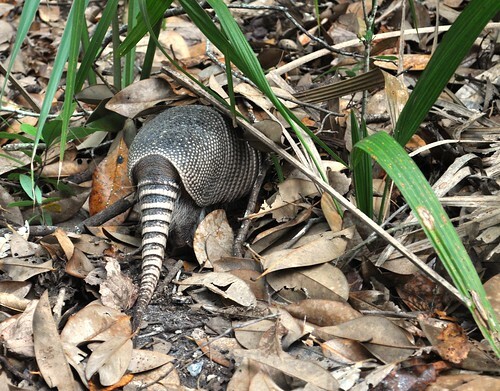 Armadillos are plentiful on Cumberland Island so when you hear rustling in the woods, look down, it’s probably an armadillo. Or, maybe a wild turkey. Fossilized sharks teeth are suppose to be plentiful but since I live in Southwest Florida with easy access to these prehistoric treasures, I didn’t look for any. There are no supplies available on Cumberland Island so bring a lunch, snacks, water, sunscreen, insect repellent and rain gear. Comfortable shoes and a jacket are vital, too. It’s a pack it in, pack it out area so no trash bins either. Picnic tables to enjoy lunch and benches to rest along the trails are common. 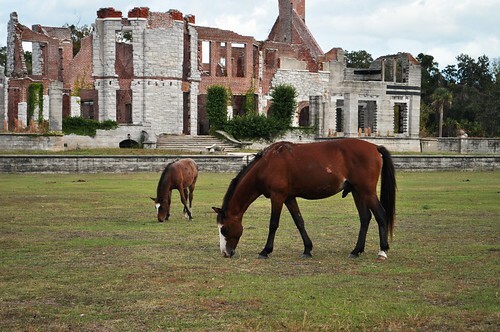 More wild horses on Cumberland Island – behind Dungeness ruins. 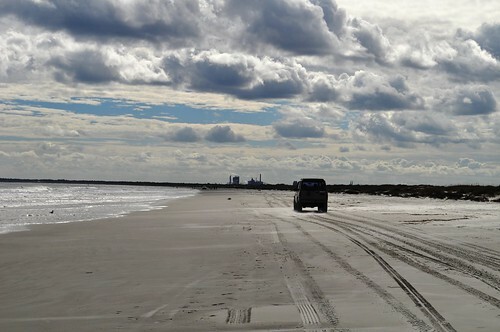 Where I spent my morning – Cumberland National Seashore, Ga.
Plus $4 per person park user fee.